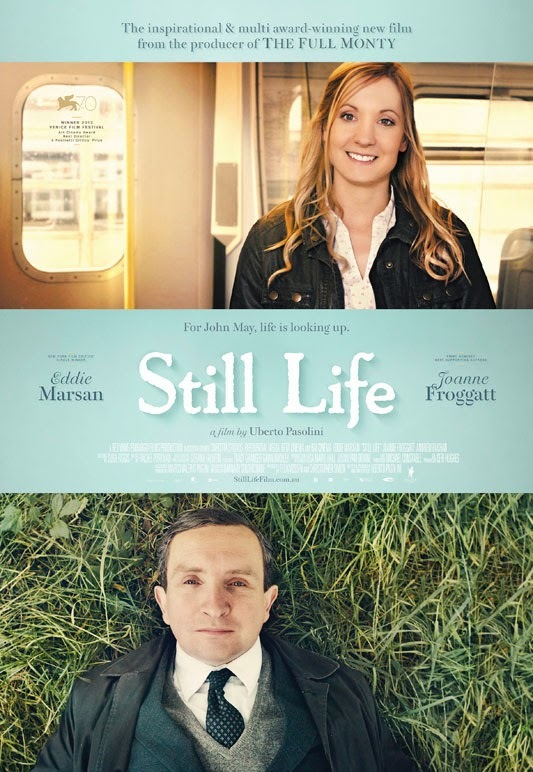 To some of the marketing, one might think Uberto Pasolini's new film STILL LIFE is a quirky romantic comedy starring the maid from Donwton Abbey. But it's something far more interesting: a patient, elegiac wryly observed drama about a lonely man who does his best for those forgotten by society. He's charged by the local council with finding the families of the people who die alone and unloved, and if he can't, he uses what he has pieced together of their lives to give them a touching funeral, attended only by him. This man, Mr May, is a gentleman in every sense of the world, but he's become detached from life, in a well-ordered but solitude existence. As we watch him delicately pick his way through the lives of others we see clearly the trajectory he is on, and wonder how conscious he is of it: that he too will die alone, unloved and perhaps undiscovered. The lever upon which the movie turns is the casually indifferent sacking of Mr May by his boss. He's being too diligent, you see, and is being rationalised. It's amazing how in a few short scenes Pasolini and the actor Eddie Marsan capture the nasty quick indifference of this act, in contrast to the more glossy George Clooney satire on unemployment, UP IN THE AIR. As a result, Mr May decides to devote himself to his last case, that of alcoholic shut-in, Billy Stokes. He follows his trail through the English countryside, discovering new people and broadening his emotional landscape in the process. If all that sounds cheesy and obvious it isn't. Mr May barely says anything and the degrees by which he defrosts are miniscule. The film could only work with an actor of the calibre of Eddie Marsan who can betray shifting emotions in a single glance. He also balances the melancholy and the dry humour perfectly. We care about him and respect him and will him to succeed. The second reason why the film works is Pasolini's ability to capture the alienation of modern life which a real delicacy of touch that's only undone with a rather fantastical final scene. Take that away and you have a near perfect patient arthouse movie - even with it, it's damn near perfect. STILL LIFE has a running time of 93 minutes. It played Venice 2013 and went on release in Italy in 2013 and the USA in 2014. It will be released in the UK and Ireland on February 6th.